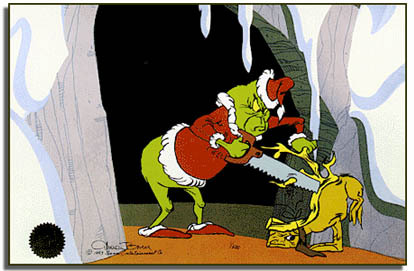 Chuck Jones directed Dr. Seuss’s ‘How The Grinch Stole Christmas’ in 1966. It has become an icon in American film and a timeless holiday classic. “On Becoming A Reindeer” is a hand-painted limited edition cel accompanied by a fine art lithographic background recreating a classic theme from the original film scene. The edition was created from animation artwork by Chuck Jones, and each work of art is hand-signed by him.